Although author Gladys Mitchell wrote nearly ninety novels (Including eleven under two different pseudonyms), her work has been forgotten by most readers. Born in England on April 21, 1901, she became an English and history teacher. 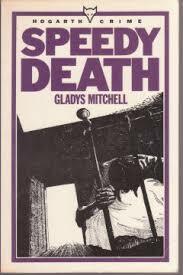 Publishing her first novel, Speedy Death, in 1929, she was a prolific writer, issuing at least one book per year. Despite her success as an author, she continue to teach until 1961 when she retired. She continued writing until her death at aged 82. Sixty-six of Mitchell’s books feature Beatrice Adela Lestrange Bradley, a “modern woman” who held a distinguished academic career. Her biography is rather convoluted and inconsistent (Keeping track of characters can be difficult. I can’t imagine doing it for that many books!). Mrs. Bradley was married twice, and perhaps a third time. She had at least two sons and perhaps more. A highly intelligent woman, she received numerous degrees. Using her prodigious knowledge to solve crimes, she is reminiscent of Sherlock Holmes. Mitchell wrote a series of historical novels under the name Stephen Hockaby and a series featuring architect Timothy Herring under the name Malcolm Torrie. She also published ten children’s books under her own name. 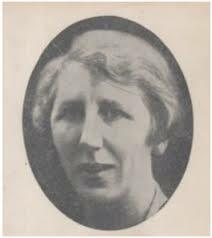 The Detection Club was founded in 1930 by a group of British mystery writers, and Gladys Mitchell was an early member. The club included such legendary authors as G.K. Chesterton, Agatha Christy, and Dorothy Sayers. Two of her books were adapted for radio in the early 1990s, and in 1999 Diana Rigg took the role for the BBC series Mrs. Bradley Mysteries. Most of her books are out of print, but can be obtained through Amazon as ebooks. Better yet, check your local library for one of the gems.